Symptomatic treatment of nausea and vomiting. Adults and children over 12 years of age: 1 capsule/8 h, up to a maximum of 70 mg per day (equivalent to 7 capsules). Pregnant women: if the nausea occurs in the morning, take two capsules upon going to bed. If the nausea occurs during the day, take one capsule in the morning and another in the afternoon. Glaucoma, pyloroduodenal obstruction, intestinal obstruction, stenosing peptic ulcer, urinary bladder obstruction, symptomatic prostate hypertrophy, urinary retention, hyperthyroidism, cardiovascular alterations and hypertension as the anticholinergic effects of this medicinal product may worsen these conditions. Lower respiratory tract disease, such as asthma, pulmonary emphysema or chronic obstructive pulmonary disease. It has been demonstrated that antihistamines reduce the volume of bronchial secretions and increase their viscosity, thereby making bronchial expectoration more difficult. This may result in respiratory obstruction, which could worsen these conditions. As such, care should be taken in these patients. Photosensitivity reactions: As an increased sensitivity of the skin to sunlight, with photodermatitis, has been observed with some antihistamines, sunbathing should be avoided during treatment. The antiemetic effect of Cariban may interfere in the diagnosis of appendicitis. As it may mask symptoms of ototoxicity (such as tinnitus and dizziness), Cariban must be administered with care in patients treated concomitantly with potentially ototoxic medications. Care should be taken in epileptic patients as antihistamines have occasionally been associated with paradoxical hyperexcitability reactions, even at therapeutic doses. Anticholinergic agents (tricyclic antidepressants, MAOI, neuroleptics): may enhance toxicity due to the addition of their anticholinergic effects. Ethyl alcohol: enhanced toxicity, with altered intellectual and psychomotor capacity, has been reported in some studies. The mechanism has not been established. The anticholinergic effects of this medicinal product could lead to false negatives in dermal hypersensitivity tests with antigen extracts. Suspending treatment at least 72 hours before the event is recommended. Numerous epidemiological studies which indicate that Cariban does not exert adverse effects on gestational development or on the health of the foetus or newborn have been performed. Epidemiological evidence concerning its possible association with congenital malformations has been summarised in two meta-analyses. The first of these gave an OR for any congenital defect of 1.01 (95% CI: 0.66-1.55) and the second an OR of 0.95 (95% CI: 0.88-1.04). As such, both conclude that Cariban is not associated with an increased malformation rate. Consequently, Cariban may be used safely during pregnancy when indicated. Although pyridoxine is not toxic at the recommended dose, chronic administration at high doses may cause neurotoxicity. Pyridoxal (the active form of pyridoxine) crosses the placental barrier, reaching foetal plasma concentrations 5 times higher than those in the mother. The influence of Cariban on the ability to drive and operate machinery is significant. 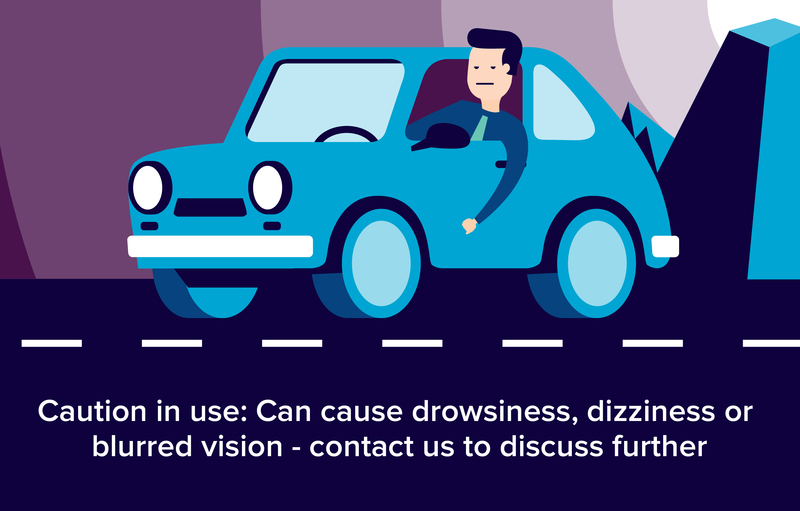 This medicinal product may cause drowsiness, especially during the first few days of treatment, therefore situations that require a special level of alertness, such as driving vehicles or using hazardous machinery, must be avoided during treatment. Very common (≥1/10); common (≥1/100, <1/10); uncommon (≥1/1000, <1/100); rare (≥1/10,000, < 1/1000), very rare (<1/10,000). The undesirable events are listed in descending order of severity within each degree of frequency. Common: dry mouth, constipation Uncommon: nausea, vomiting, diarrhoea. The adverse reactions mentioned above arise due to the action of doxylamine succinate as pyridoxine hydrochloride does not present side-effects, although chronic administration at high doses has been associated with neurotoxicity.